I have no doubt that the ongoing trade war’s evolving into the next round of currency wars. . . This is a contrarian opinion – especially because yesterday China said they have “no desire” to devalue the Yuan in attempt to boost exports. And this came after U.S. Treasury Secretary – Steve Mnuchin – saying he sees “no chance” of a currency war – despite President Trump’s recent comments. But – as a rule of thumb: when the government tells you there’s ‘no chance’ or ‘no intention’ of something happening – it’s most likely already well-under way. . . So when both the U.S. Treasury and Chinese Finance Ministry shoot down the idea that they will engage in a currency war – you should take it as that’s what is coming next. . . Months ago – many mainstream pundits went on about how China wouldn’t dare use currency devaluation to get a leg up in the ongoing trade war. Yet over the last five weeks we’ve seen the Chinese currency – the Yuan – devalue at a record pace and hit a 13-month low against the dollar. It even outpaced the infamous 2015 devaluation – which triggered violent market turbulence worldwide. The timing of the recent Yuan depreciation has skeptics – like myself – wondering if China’s declaring a ‘covert’ currency war. . .
What I mean by ‘covert’ is that China will tell the public that they have no desire for currency manipulation. But behind the scenes, they will do the opposite. This seems like the case – because they have done nothing to curb the weakening Yuan. And yesterday alone the Chinese Central Bank (PBOC) injected $502 billion Yuan into financial institutions. For all we know China has started printing Yuan out of thin air and purchasing dollars on the foreign exchange markets – pushing the Yuan lower and the dollar higher. Therefore – regardless of what the politicians tell the masses – this trade war’s escalating into a currency war. . .
And as both the world’s largest economies begin weaponizing their currencies – this will be felt across global markets. Especially because the world’s reserve currency is the dollar. So any aggressive weakening or strengthening of it will be felt everywhere. 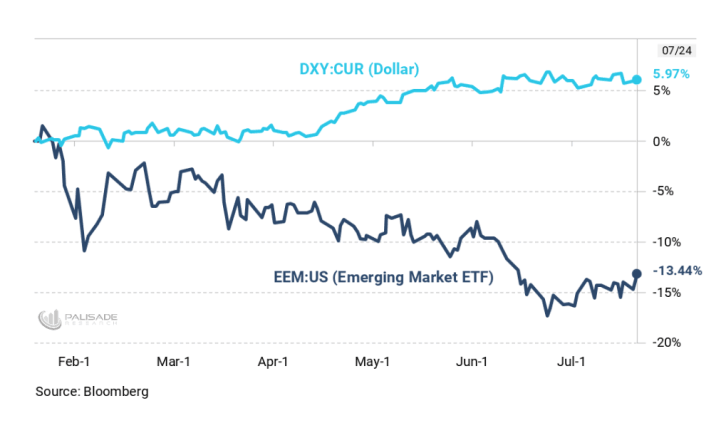 Just look at the ugly mess that’s plagued the Emerging Markets since the dollar’s 6% rally over the last six months – beginning in February. This isn’t a coincidence – when the dollar strengthens, all other currencies and commodities will weaken. This is the kind of contagion we can expect from the U.S. vs China currency war. As China weakens the Yuan – which in turn makes the dollar stronger – it will wreak havoc on foreign markets and currencies. As of today – the dollar appears over-valued according to the International Monetary Fund (IMF). This no doubt will iritate President Trump as he sits and watches the dollar become further over-valued – affecting U.S. growth and exports. He may retaliate with further tariffs – he already told CNBC that he’s ready to slap tariffs on $500 billion worth of Chinese imports. But China won’t sit idly by as this happens. They will announce tariffs of their own and continue covertly devaluing the Yuan – offsetting any losses. The big questions now are. . .
Will Trump break the taboo of Presidents interfering with the Federal Reserve to push monetary policy in the direction he wants? How much longer will he let foreign countries manipulate their currencies to put “America Last”? Is the Yuan’s recent decline due to market forces – or is China charging ahead with a covert currency war? 4. 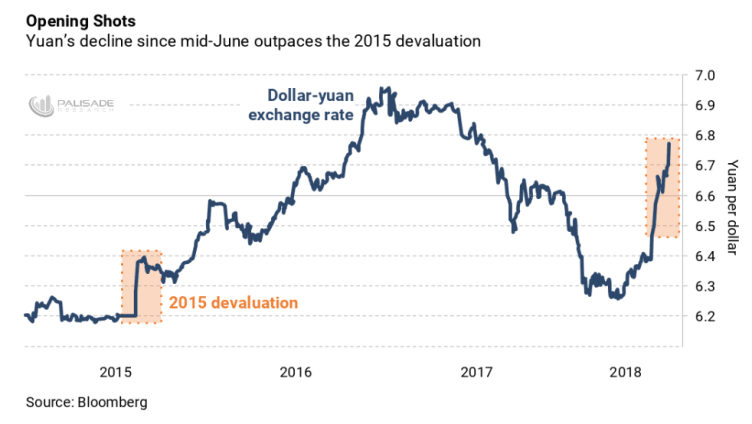 Will the Yuan’s depreciation trigger the same kind of global market chaos that followed China’s 2015 devaluation? It’s becoming clear that the trade war has evolved into a currency war – whether it’s deliberate or not. The Chinese Yuan will continue being a thorn in Trump’s side. And don’t forget: Trump’s made it clear that you shouldn’t go out and tell people your strategy. So – for example – if the Treasury was engaging in a currency war – they wouldn’t admit it. We saw Friday that Trump’s definitely paying attention to currency values. And he might’ve realized by now that with his tweets he can violently move foreign exchange markets. Whether China and America have “no desire” or “no intentions” of a currency war – it’s already well underway.